Are you looking for an opportunity to implement your creative ideas at work? 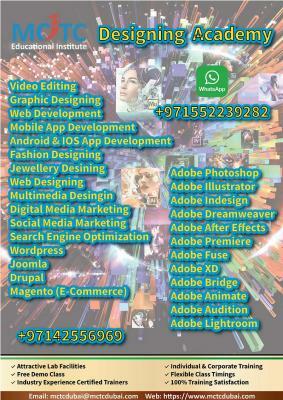 Make a career in designing field! MCTC Dubai will help you to learn designing courses from the scratch to advanced level. We offer several designing courses with the help of expert full-time faculties in Dubai. Free demo available for all the courses. You have the complete freedom to choose the course and customize your contents as per your requirements. We will train you designing through complete practical assignments that will make you ready to work in an industry easily. Affordable fees, open 7 days a week, flexible class timings and more!